The view looking into Oradour-Saint-Genest Department 87, Haute-Vienne, from the north on the D91. Oradour-Saint-Genest is some 34km due north of Oradour-sur-Glane and as seems typical of these small Limousin centres of habitation, the church is on the left at the entrance. 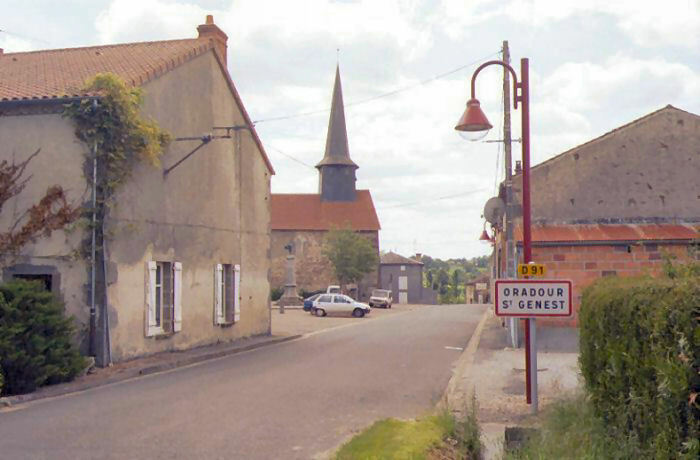 Saint-Genest is small, not much above the size of a hamlet, or very small village. It is built on a hillside and I do not think there could ever have been any confusion with Oradour-sur-Glane. See also the view from the south, which shows the quite steep slope up to the church.